Maybe this leopard can change her spots. I'm the perennial thriller reader. I read thrillers because they are often fast passed, make my heart beat faster and I love a suspenseful read. So why have I found myself bewtiched by the author JoJo Moyes? I have just finished my third book The Ship of Brides and will be singing its praises to everyone I meet. It’s the end of World War II and thousands of Australian women, War Brides, will be traveling to England to reunite with the men they married. Over 600 will not have the luxury of traveling on a ship like the Queen Mary with all of its amenities, but will make the six week journey on The Victoria, an aircraft carrier. The Victoria is ill suited as a vessel for women, outfitted for its crew of men and planes. The book focuses on four of the brides allowing us a window to their hopes, fears and dreams. These four along with the others are leaving all that they know, all who they know behind to start a new life on foreign shores. Even those madly in love wonder at the sanity of their decision. And what of those who mid-voyage receive a sort of Dear Jane letter, one stating What I really liked about The Ship of Brides is how it made me think. I started to wonder about the women and ship the book is based on. How much fact, how much fiction? It took me on a new journey seeking answers. If you have any desire to know more about this slice of history three websites provided lots of information, the best being The National Archives of Australia. These also were worth scouting out HMS Victorious, Rootsweb Warbrides. In addition it brought me back to memories of the war and how it affected my family. I am a baby boomer who wishes I asked more questions about their experiences leading up to, during and after the war before I lost all those who could answer. The Ship of Brides held my attention from start to finish. I have become a fan of JoJo Moyes all over again. I'm so glad I haven't read all her books yet. This is something to truly look forward to. 2.5 StarsThis is my fifth Jojo Moyes novel and, unfortunately, the only one I thought would never end.The storyline is GREAT based on actual historical events of post WW2 war brides traveling aboard a naval warship to reunite with their husbands in England. I also enjoyed reading the newspaper and journal entries posted at the beginning of each chapter, but other than Frances' and Nicol's story, I am sorry to say, it was pretty much slow going with confusing dialogue and needless catty conversations throughout a good portion of the book.Cannot recommend this 2005 JJM novel, but enthusiastically look forward to future offerings.Highly recommend: and . So...ummm....yeah....I just finished this and I don't have words. Multiple superlatives will be used. This one moved me in so many ways. Holy shite, what a story. I became quite attached to Frances and Maggie. I will miss them.Jojo Moyes is a versatile novelist. She picks a topic she wants to write about and makes it her own. There's a richness and depth to this story that surpasses Me Before You. What a wonderful book that I've just finished. One of those that really mean something. It was a pleasure to read this book, the first of Jo Jo Moyes that I have had the pleasure to read. This is a beautiful story that is based on a factual voyage, each chapter starts with an non fictional extract based on experiences of war brides, or those who served on the 'Victorious'.The year is 1946, and almost 700 war brides are making their way to England, the war is over. We follow a group of gals who have so many stories to tell. Maggie - feisty girl of the land. Lovely. Avice - society girl, vein and focused on things not so important. Annoying. My favourite (just!) Frances - capable nurse who has survived a horrible upbringing. A treasure. We learn about life on board in trying times, and the crew that is charged with getting our brides there safe and sound. I also enjoyed the character of the captain, and Henry too.I've always enjoyed and appreciated a book that educates me, and this really did. This should be read by students as well, there's a true story amongst the happy and sad moments. The poor brides who received a telegram 'Not wanted, don't come'. Heart breaking.Please do read this, highly recommended by this Aussie girl who has learnt a lot. Hats off to Ms Moyes for not just a novel, but a thoroughly researched piece of work. A perfect holiday read. I will think about this a lot, it's gotten to me! I felt like I was on a slow boat to Britain right along with them. I love JoJo Moyes and her ability to make Chick-lit (which I love), just a bit different. Some of her books are based on historical events, again something that I find is a great asset to her writing.However, and it is a shame to say that, this book just didn't work for me. I found the storyline hard to get in to, possibly a little dull at times. I don't know much about the subject of Australian war brides and the book didn't really help. I found it hard to pick up on the love the brides had for their English husbands when we had no idea on their backgrounds.I want to keep trying to get through this, I wouldn't recommend as the best book to get into JoJo Moyes. Firstly I have to say that this is a tough book to get into. I put it down many times and only read little bits at a time, It almost felt like I was reading this for school. If it was by any other author I would've given up. I'm so glad I kept with it.Once you actually read a meaty chuck of it you start to feel like your really on board the ship apart of these brides lives. Characters/POVTold in third person narrative, there a 4 main brides out of the 650 women who end up being roomies together.Margaret - A farm girl who's heavily pregnant.Avice - A society type, wealthy. Her pov is a bit snobby towards the other girls at timesJean - A 16 year old bride, chatty, drinks alot of alcohol which leads to her downfall. No pov from her.Frances - A nurse, quiet, like's to keep to herself, trying to escape her past. There's a mix of these 3 brides povs throughout the book, If I where to tell you who the main character is it would be a toss up between Margaret and Frances, there's more from Margaret in the first half and the second half we have more of Frances pov once we find out her past. If I were to spoil it for you I would say this is more (view spoiler)[Frances book (hide spoiler)]Two other male characters povs that feature in this is the captain and a marine who stands guard outside the womens room.The second half and especially the last chapters of the book have more of the Marines povRomanceThe romance was a small part of the book, there's a very slow slow build up of romance between Frances and Nicol(Marine) and its more present towards the last quarter of the book. I absolutely loved this!!! you desperately want to know if they end up together. Most of the book takes place on board the ship in 1946 with the last part 2 chapter having them arrive in England. Part three only has one chapter which I guess is more of an Epilogue, that takes place back in 2002 where the book started from.Is this a sad book?Not really, there a are things in the brides lives that happen on board that can be a bit sad, they all start off stepping aboard exited to be reunited with their husbands in the end...(view spoiler)[ only one of the brides is happily reunited with her husband. (hide spoiler)]Although, once I got to chapter 26 and read 9 words I completely balled my eyes out.. I couldn't believe that 9 words could instantly bring me to tears. I actually took a bit of a brake and let the information sink in and had a really good cry. I realised I probably wasn't going to get my HEA. I forced myself to continue, crying along the way, those tears stopped and I started smiling, grinning, laughing, racing to the point where what I was crying over wasn't what I thought it was. I swear! my face hurt from all the emotions a felt during that last chapter!! OMG Author!! really?!! Incredible!Lets just finish this off and say that this book does have a very good HEA. There's no epilogue but you do find out what happen to 3 of the brides. I would have liked to know what became of Jean though. But I'm happy with what I got. I think what made it more special was that the voyage was based on the real HMS Victorious, great to know about this piece of history. I like Jojo Moyes but I'd avoided reading this one because of the time period. It's not something that interests me BUT what a mistake. I was quickly drawn in to the lives of these Australian women en route for the UK after the war as husbands of British servicemen. I loved the variety of characters, the understated love story, it all worked really well. I could easily see this as a film! This was BEYOND boring! I thought would never end ._.The prologue was so touching I was convinced the book gonna be great. I was wrong. Great ending. Many a time I almost gave up on it. It is rather darker then I expected. Ich bin froh dieses Buch als Hörbuch gehört zu haben. Der Anfang war ziemlich zäh. Es hat lange gedauert bis ich in die Geschichte rein gekommen bin. Auch dass es aus so vielen Sichten erzählt wird, war sehr verwirrend. Es wäre besser gewesen, wenn immer dabei gestanden wäre, aus wessen Sicht gerade erzählt wird! Ab ca. der Hälfte war ich dann in der Geschichte drin und der Schluss war so spannend, dass ich nicht aufhören konnte! I loved the idea of this book, but not the execution. I'm wondering if I built it up too much in my head before reading as I thought the premise a really interesting one. I enjoyed it but this book wasn't a favorite. Actually, that's the problem I have: this book read like a tv series. I feel like you could literally hand sections of the book to a director and, in order, he'll make an Avice episode, the Frances background episode, etc.A quick, easy read with an interesting premise based on true events. Good, but it feels like it could have been so much better. I would be interested in reading more of this author's work.
. A really enjoyable read with an original and interesting plot. Great characterisation not quite as gripping as some of her other books but it's stayed with me and would highly recommend it. „Nuotakų laivas“ buvo kaip tik tai, ko man reikėjo po kankinančio“ Vilniaus pokerio“, bet bendrai tai reikalą su Moyes matyt reiks raukti ir ieškoti naujų prasiblaškymo plotų. Fabula apie kelis šimtus australių karo nuotakų plaukiančių lėktuvnešiu į Angliją pas savo vyrus tikrai įdomi, kažkaip net pats pasakymas „karo nuotaka“, nors ir akivaizdus, sąmonę padoriai pasiekė tik skaitant. To tokio kad ir nedidelio tikros istorijos dvelksmo suteikė ir tikros laikraščių ar atsiminimų ištraukos, nors šiaip tai romanui ir ne kažin ką davė. O šitas reiškinys buvo dar vienas papildomas, nors ir palyginti juokingas, karo nuostolis. Negali statyti į gretą su milijonais žuvusių, sužalotų ir palaužtų žmonių, o iš vienos pusės daug tų porų turbūt laimingai gyveno ir jų gyvenimas pasisuko gera linkme, bet kai pagalvoji apie visumą, tai tėra dar vienas suardytos tvarkos pavyzdys. Bet čia ir baigiasi šitos knygos pliusai – siužeto ne kažin kiek, o ir tas nuspėjamas, nors ryškiai ir tikimasi pateikti ne vieną siurprizą. Neradau nei to emocinio stiprumo, nei žmoniškų daugumos istorijų pabaigų, viskas staiga nutrūko ir po poros puslapių chaoso knyga buvo baigta. Po „Aš prieš tave“ vis tikėjausi dar vienos tokios stiprios istorijos ir niekaip nepasiduodu su Moyes knygomis, bet kažkaip pradedu jausti tendenciją, kad visos kitos jos knygos tiesiog paprastos, lengvos romantikos varomos istorijos, kurioms visgi trūksta kažkokios galios. 3.5 stars.This novel is set in the time period just after World War II. During the War many people from all over the world met one another and got married quite hastily, to people that they wouldn't see until the War was over. This novel starts off in Australia, where over 600 Australian brides need to be transported to their English husbands in England, to go and live as a married couple now that the War is over. An old aircraft carrying ship is commissioned for its last journey to take these brides across the sea on the six week journey to be reunited with the loved one they haven't seen in months or even years. The author introduces us to four bunk mates, from very different walks of life, as they journey to their husbands. Some are from wealthy families, some are simple farm girls, some are young and naive, and some are hiding very dark pasts.This novel is based on a true story and on the real life 'ship of brides', the Vicorious, which carried brides from Australia to England after the War, and there are some real life journal extracts from that time scattered throughout the novel. What was really cool for me is that the author's grandmother was a bride on this ship, and she relayed her stories to her to enable her to write this book, and this is what made it special for me. 4.5 stars A beautiful story that needed to be told. Another fantastic page turner from JoJo Moyes. What a terrific story! The Ship of Brides had a bit of a slow burn, which was pribebly because of the large amount of POVs for just one ship. Towards the end It got good and emotional. On October 27, 1945 the HMS Victorious set off for the first of three trips to transport WWII servicemen and war brides. Jojo Moyes's own grandmother was one of those brides, traveling from Australia to England to be with her husband. 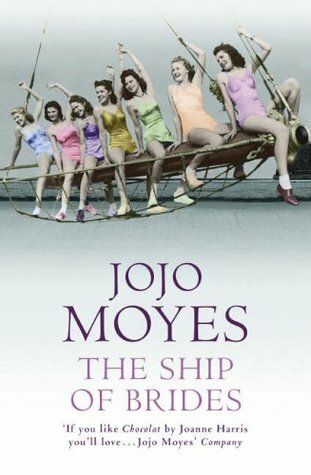 According to the acknowledgements, her story and others inspired The Ship of Brides, which was originally released back in 2005 but has recently been reissued by Penguin.The war has ended and out of the remaining war brides in Australia, Margaret, Avice, Jean, and Frances have each been chosen to travel to England aboard HMS Victory in a push to reunite them with their husbands. They aren't the first to travel to England and they aren't the last, but they're the lucky ones who won't have to wait any longer. The four couldn't be more different from one another and yet they find themselves bunkmates on the newly outfitted aircraft carrier. Margaret is massively pregnant; Jean, at sixteen, is among the youngest on board; Frances, a former nurse, is quite closemouthed about her past; and Avice is a society girl who'd hoped for roommates of a different class. But they each have one thing in common: they've left behind everything they know to start a new life. Decades later, one of these women gets the shock of a lifetime when she stumbles upon a reminder of that fateful journey. I rather liked The Ship of Brides, and I really wasn't sure that I would at the start. Mainly because I'd looked forward to it for so long but never really felt I was in the right mood for it. But I forced myself to sit down with it one evening and soon found myself quite taken in by the story.This one is very different from the other titles I've read by Moyes thus far. To be honest, that was appealing at this stage as both One Plus One and Silver Bay had a lot of common elements between them. And while there is some of that in The Ship of Brides, the premise and the WWII setting couldn't have been more different!This was most definitely a piece of history that was fairly new to me. Not so much the war brides aspect but the fact that such a massive undertaking to deliver these women to their new homes had occurred. Moyes does a wonderful job blending in historical quotes from real men and women concerning the actual HMS Victorious mission, setting the scene mood of the novel quite nicely. Each of the characters came across as genuine in both emotion and setting, making it easy to imagine them as real people. Bringing the story forward to the present day was also a nice touch that added another layer of believability for me as the reader.Ship of Brides may not be what you've come to expect from Moyes but it is a wonderful historical read, perfect for anyone who enjoys WWII fiction. This was my second Jojo Moyes book, after reading and thoroughly enjoying 'The last letter from your lover'. The Ship of Brides is a moving story based on a real events taking place in the immediate aftermath of the Second World War, as thousands of young women were transported to Great Britain or the United States from Australia to meet up with the GI-husbands they married when they were stationed in the country during the conflict. In many cases, these young women left their families and homes behind to take a painfully long journey steaming across the oceans for weeks, heading to an uncertain life in a foreign country.Beginning on a beach/ship graveyard in present-day India, the broken hull of a warship being scrapped brings back unexpected and overwhelming memories for an elderly grandmother on holiday. We are then taken back to the days immediately post 1945 and a story centering on four very different young women who are thrown together in sleeping quarters aboard the soon-to-be-retired Royal Navy aircraft carrier HMS Victoria. Together with hundreds of other young women on the ship, they are travelling to England to meet again the men they married when stationed in Australia as the war raged in the Pacific. They're heading to a life and country that's foreign, meeting their new families for the first time - having left their own families and friends behind, they must adjust to a tense and cramped life aboard the ship as well as the all male crew which leads to incidents and encounters, both unfortunate and uplifting.Adding particular depth to the story is the fact that The Ship of Brides is based on an actual journey that took place in 1946 on board the HMS Victorious and many of the diary entries and journal records of some of the crew and passengers of that journey are included at the beginning of each chapter. This adds the real emotion of actual events to a tale that is nicely written by Moyes and is rich in human warmth. I really enjoy Jojo Moyes' writing and The Ship of Brides is a lovely and moving story. It reminded me again of the sacrifices and experiences of that extraordinary generation that fought the Second World War and built a new world in its aftermath, giving up so much and embarking on long and arduous journies to build a life we today simply take for granted. I found the premise of this book to be more compelling than the actual story. I love a good, big, historical fiction romance novel, and I love the fact that it was based on true events of the day. The book itself left much to be desired. It was so slow in the beginning. I read this on my kindle and was 53% through before I was actually interested in reading more. Throughout, I wanted to know more about the relationships with the brides and their husbands. The book was primarily based on the relationships they develop on board with the other brides. It wasn't until the very end of the book that many pieces of the story came together. This may be a great plot device for a thriller or mystery, but I found it more annoying than anything else. I don't like having to guess what the characters are thinking about. For example, the Captain's back story was excruciatingly slow to develop. I won't refer to the other back stories as it would spoil the story.I have really enjoyed other JoJo Moyes books and look forward to reading more in the future. This book just fell a bit short for me.One thing I did enjoy was learning many foreign Australian and British colloquial terms. I had to use the dictionary button many times to figure out what they were talking about! I was pleasantly surprised by this novel. I might actually say I was shocked by how involved and interested in it I became.JoJo Moyes weaves together the stories of four very different women into a comprehensive masterpiece. I was surprised to find that even in the telling of such an intricate tale, none of the women's stories felt ingenuine or like plot devices; even the mysteries surrounding them unravelled in what felt like a natural way. Nothing about this book was forced or overwrought, which is the problem I have with so much modern fiction. Aside from the overused "story-within-a-story" aspect factor manifested in the form of an elderly narrator who appears only in the first and last chapters, I found the entire novel to be a compelling and beautiful story. Such an extraordinary book centred so deeply or the women who travelled over after the war of 1945. How these thousand of females war brides travelled over the ocean to England. I loved this most amazing book written by Jo Jo Moyes. She is certainly a favourite of mine indeed!Discovering who is on aboard this trip. So many stories are told all by so many different women all suffering too. So much history in this travel so far for all these poor women. I really enjoyed all these different stories.An amazing historical book this turned out to be. As an Australian myself I thoroughly enjoyed this book. * I recommend this book to everyone!! In 1946, after careful negotiations between the British and Australian governments, HMS Victoria left Sydney with over 600 "war brides" on board, plus 1000 naval staff. The brides were all Australian citizens who had married a UK citizen during wartime and in many cases, hadn't seen their husband for years. This is a time when a flight between Sydney and London had only just begun (at a speedy 63 hours! ), Australians were seen by many British as country bumpkins, and decorum and reputation were more important than most other character traits.This novel gives a fictionalised account of this journey, concentrating on four characters who share a berth for the 6 week voyage. The book starts and ends in 2002, but the other 95% of the book is based on the HMS Victoria's voyage. Over the six weeks we learn the background of each of these women and the secrets they are keeping. We also get a good insight into the ship Captain and a Naval officer. Another great novel from Moyes who really does excel at character development (perhaps with the exception of just one book), and a great story about an important part of our history. Jojo Moyes - Jojo Moyes is a British novelist.Moyes studied at Royal Holloway, University of London. She won a bursary financed by The Independent newspaper to study journalism at City University and subsequently worked for The Independent for 10 years. In 2001 she became a full time novelist. Moyes' novel Foreign Fruit won the Romantic Novelists' Association (RNA) Romantic Novel of the Year in 2004.She is married to journalist Charles Arthur and has three children.